Chicago IVF with Dr. Jacobs M.D. IVF Chicago - Dr. Jacobs M.D. "Dr Jacobs is ULTRA-ACCESSIBLE like no other fertility doctor!!" - J.M. "Making conception a reality for hopeful couples"
Dedicated to bringing couples closer together. Properly diagnosing and effectively treating infertility. Learn about us and our procedures at our informative video gallery! If you're looking for a Chicago fertility center, you'll find the help you need at Fertility Centers of Illinois. Laurence A. Jacobs M.D. 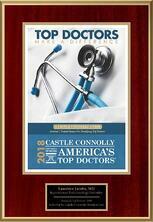 is a Mayo Clinic-trained reproductive endocrinologist and senior partner of Fertility Centers of Illinois. Our rate of success is high when it comes to helping people have the families they want. 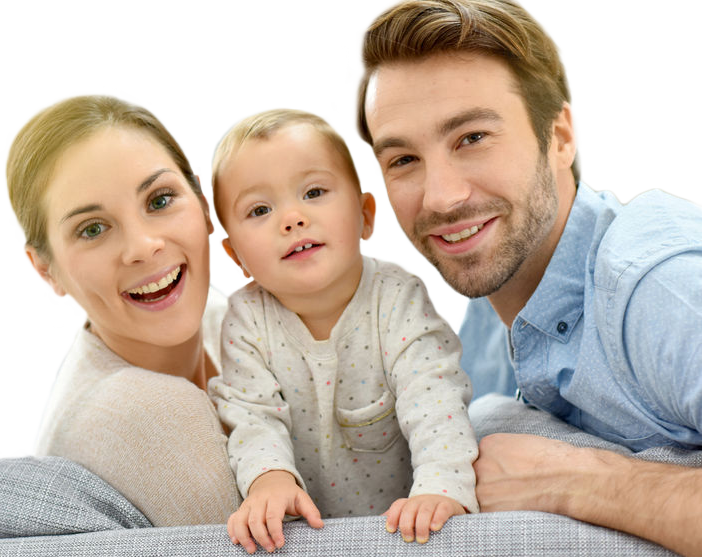 At Fertility Centers of Illinois, we are committed to solving our patients' fertility problems and helping them achieve their dreams of having children. We use proven conventional techniques, as well as the latest treatments that technology has to offer. All of our patients get the personalized attention they need, because we know that every case is unique. From fertility testing, to In Vitro Fertilization (IVF), you can count on our experience and expertise. There can be many factors contributing to one's inability to conceive or carry a child. Problems can range anywhere from general poor health to a specific reproductive condition. That's why we've developed a program helping patients improve their overall health and fitness while they are going through their treatment plan. We care about the people that come to us for help, and it shows! When you need the services of a Chicago fertility center, the right place to call is Fertility Centers of Illinois. We treat patients from Chicago, North Chicago, Northwest Chicago suburbs, and Buffalo Grove. Dr. Laurence Jacobs brings over 38 years of experience to every case. Dr. Jacobs has been consistently rated as one of Chicago's top doctors from 2001 to 2018. We'll be glad to speak with you about financing options if you need it. Call and make an appointment today. Fertility Centers of Illinois has 10 fertility clinic locations and 2 IVF centers throughout greater Chicago for you to visit. All 10 office locations provide ultrasound scans and blood test monitoring for your convenience. Welcome to the website of Laurence A. Jacobs, M.D., a Mayo Clinic-trained reproductive endocrinologist and senior partner of Fertility Centers of Illinois (FCI). FCI has more IVF babies than the next ten fertility clinics in the Chicagoland area combined. Offering the latest and most advanced treatments as well as tried-and-true conventional techniques, Dr. Jacobs is committed to finding solutions to fertility problems and helping patients fulfill their dreams of having a child. Whether you are seeking diagnostic fertility testing or IVF, trust our infertility clinics in Illinois to provide the care that you need. There is a wide and diverse range of medical problems that can interfere with a person's ability to conceive a child. Some of these are specifically reproductive conditions and others are more general health issues. Because all infertility treatment procedures, including IVF, are generally more effective when a patient is in good health, and because excess weight and poor overall health can contribute to a patient's infertility, Dr. Jacobs has developed a program to help patients at our Illinois infertility clinic improve their fitness as part of their fertility treatment plan. Learn more about the Fitness and Fertility program. MEET LAURENCE A. JACOBS, M.D. Since 1988, Dr. Laurence Jacobs has been providing IVF and other advanced treatments to patients of his infertility clinic who have struggled with infertility. 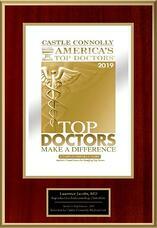 He is the only Chicago-area reproductive endocrinologist to be consistently named in all Castle Connelly's publications, America's Top Doctors (top 1% of specialists in America), and Chicago's Top Doctors (one of the top fertility doctors in the Chicago area) from 2001 to 2018. 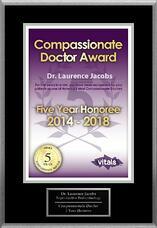 Dr. Jacobs is also the only doctor in the Chicago area to hold these honors for 15 consecutive years. His professional experience gives him the knowledge and skill to accurately assess the problem, recommend the most effective treatment plan, and provide exceptional medical care. His personal experience as a former fertility patient helps him to empathize with his patients and provide the kind of support and encouragement that can make all of the difference. Dr. Laurence Jacobs is 'ultra-accessible' by phone or email to help his patients. "I've always had a passion for science and have enjoyed helping people. 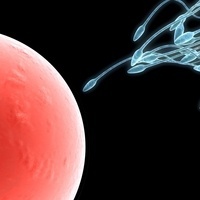 I like the challenges of detailed, complicated fertility work, not to mention the 'journey' from problem to solution. After earning my undergraduate degree in biological science, I chose to become a physician because it provided me an opportunity to apply medical science in a very tangible, personal way. I opted to specialize in obstetrics and gynecology—and then to sub-specialize in reproductive endocrinology and infertility—for similar reasons, only to a greater extent. It's a very interesting cutting edge science, and the results are a tremendous source of pleasure." If anyone has the need for a fertility specialist, Dr. Jacobs is by far the #1 person in the U.S. I would recommend. And I would know, because I'm the producer of one of America's most comprehensive films on infertility and I've personally worked and utilized the services of Dr. Jacobs. I recommend him highly and without reservation. "Dr Jacobs is ULTRA-ACCESSIBLE like no other fertility doctor!! He is hands-on and very accessible, by phone or email… and not just during office hours. Thanks to e-mail, I got same day answers to all my questions and concerns…it helps more than you know during difficult times when you want so many answers and the emotions are so high." You have done it again ... you have given us what I consider a miracle. I don't know where we would be without you. I want you to know that even when I am not going through fertility, I look at my girls and I often think of you and how blessed we are to have been under your care. Our beautiful family is complete because of you, and we will forever be grateful, thankful and appreciative of your time and your dedication to your profession. 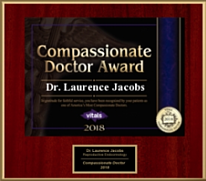 Read more testimonials for Dr. Laurence Jacobs. 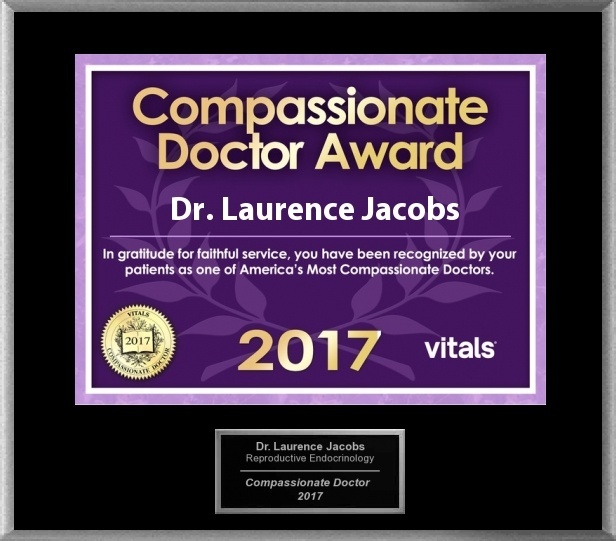 "You will not find a doctor that is more kind, compassionate and dedicated to helping you grow your family than Dr. Jacobs. He is incredibly personable and tries to connect with his patients. We had many set backs along the way and he never gave up on us and kept pressing to find a solution. Dr. Jacobs always took the time to thoroughly explain everything, make sure you knew all your options (even if they are ones you do not want to hear), and make sure all your questions were answered." Dr. Jacobs and his staff are extremely available, knowledgeable and caring. Dr. Jacobs kindness and cutting edge knowledge together make him the best doctor. Him and his staff treat their patients like family. Dr. Jacobs and his staff were always available to address my concerns and anxiety during this difficult time. Also, Dr. Jacobs is one of the only doctors who does the ERA procedure, allowing A successful IVF treatment! I would absolutely reccome d Dr. Jacobs to family and friends! I cannot say enough good things about Dr Jacobs. We had a failed FET with a different doctor. Dr Jacobs actually took the time to try to understand why the FET failed (after a successful fresh transfer 3.5 years ago). He suggested the right tests, explained the benefits and the plan. Throughout the whole process we were part of the plan as opposed to being told what the plan was. Dr Jacobs was always available for us to reach out to and his nurses were wonderful and very responsive as well. We would never see another RE, even if we moved from the area. Patience, warmth, discipline and diligence are few words to describe how he manages his patients. How often do we get personal email access for a doctor, the assurance that we are not alone in this fight. He guided us at every step and helped us understand what we were doing and how. Jennifer G, Helen, Melissa 9/20/2017 from P.C. I can not say enough wonderful things about Dr. Jacobs or his staff. After 8 years of trying to conceive, several female surgeries, one remaining ovary , no fallopian tubes and going through 3 unsuccessful IVF's with other doctors and then coming here to Dr. Jacobs for the 4th IVF, which I conceived identical twin boys from, it was a breath of fresh air from the moment I walked in the door. Dr. Jacobs was very personable and always available to me whenever I had questions and his staff was the same way. They all made the IVF process positive, relaxing and calm rather than stressful and tense. He is an amazing doctor in every way. If I could recommend everyone going through fertility treatments and having trouble conceiving to see Dr. Jacobs I would and in fact I have referred a couple friends to him who have both gotten pregnant and had babies. I am so incredibly thankful and grateful to him and his staff and hope that he continues his practice for many many years to come. Fertility Centers of Illinois has 10 fertility clinic locations and 2 IVF centers throughout the Chicagoland area. After you see Dr. Jacobs, you can choose from all 10 office locations for ultrasound scans and blood test monitoring.